Wild boars are fearsome, dangerous animals, yet prized for their meat, and a favorite game animal of the Celts. The boar to the Celts was an emblem of fertility, fearlessness, and strength, but also stubbornness, war, and chaos. 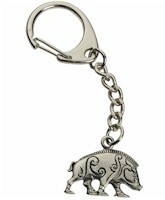 This Celtic boar is made from lead-free pewter and is hung on a quality key chain.